Learning through struggle is not something any of us want to experience, but it’s a necessary part of life. You see, productive struggle is necessary for growth whether it be in learning a new math concept or the realities of sin in our lives. But, it’s still difficult to experience, and even more difficult to watch someone you love experience it…especially your child. Discover three reasons why we experience personal struggles in life and ways to find strength. When my child looked up at me with tears in his eyes, and asked me this question, I wasn’t entirely sure what to say. On the surface, this question seemed so easy to answer. I could’ve just said, “Well, we can’t be good at everything.” And then moved on to my jam-packed list of daily tasks completely oblivious to the real question. But, I am so thankful that the Lord stopped me in my tracks. This struggle he was experiencing had created an opportunity to dig into one of the hard questions of life, and I knew it was about a whole lot more than the math concept in front of him. As usual, I had to take a minute and gather my scattered thoughts. I silently prayed for wisdom and the Lord revealed the true depth of what my son was asking. I explained to him that everyone has a choice in responding and dealing with difficult situations. We can either choose to wallow in self-pity, and become so devastated by our struggles that we are ultimately consumed by them, or we can endure these struggles and draw strength that provides us with the ability to relate to, and eventually help, others. Through this conversation, I realized that we all acquire the same skills from struggles regardless of age. It became so clear that this is a universal question we all need clarity on. So, why do we struggle in life? The definition of empathy, according to Webster, is “the act of understanding, and vicariously experiencing the feelings of another.” Many times, we sympathize, or feel sorry FOR another person. But, to truly empathize we have to feel sorry WITH them, and experience their sorrow like it’s our own. In other words, we need to have actually “walked in their shoes,” and I experienced this firsthand when I underwent a double mastectomy and hysterectomy within a year. When my son and I had this conversation, I pointed out how school is usually fairly easy for him. I explained that his feelings of frustration and sadness were vital to his understanding of the learning through struggle some kids experience every time they are introduced to a new concept in school. It was at this moment that the “light bulb” flipped on in his mind. And that quickly, he gained empathy for kids he’d never empathized with before. Have you ever experienced this in your own life? We can feel bad for someone experiencing trials in her life, but the ONLY way to truly understand what she is going through is to be on the other side of the same struggle yourself. And the only way to be on the OTHER side of the struggle is to have first gone through it first. In its most basic terms, persistence is the ability to keep on keeping on. When we’re faced with tough circumstances, like a prolonged illness, financial struggles, or even just a difficult school subject, we learn that to get past it, we have to just keep going. A couple of years ago, my son tried out for the middle school basketball team, but he didn’t make it. He was broken-hearted, and shed several tears. But after talking through his feelings, he decided he was going to have to work harder before the next year’s tryouts. What some people would consider a failure was simply an opportunity for him to get better! Through this, he learned persistence. But, let’s just be honest for a minute and admit that we would rather just be good at something than to have to experience the necessary learning through struggle. Giving up is so much easier than continuing to work when the outcome isn’t what you expect. But, the only way to get through the darkness is to continue walking toward the light. When most things come easily to us, getting built up in pride is a real danger. If you’ve ever been naturally gifted in a particular area, understanding how someone else can struggle with the same thing is difficult. However, through trials and difficulties we learn humility. The world certainly doesn’t need any more people full of pride, but it could use a few more folks filled with humility. For kids (and adults) who’ve always been the best at everything they do, being humble can be a struggle. When the day comes that they don’t make the team or they score poorly on a test, they don’t know how to process the emotion. They’ve never had to deal with rejection or failure in any capacity, and it usually turns out to be traumatic when they do. After my son dealt with his feelings of sadness at not making the team, he showed amazing humility by choosing to congratulate his buddies that did make the team. Was it easy for him? Did part of him want to get angry with them? But, he chose to turn those negative feelings into something so much bigger than himself. He allowed his trial to teach him humility. I’m so glad my son didn’t choose to wallow in self-pity. He genuinely wanted help filtering through all of his conflicting thoughts to gain understanding. While I didn’t enjoy watching him learning through struggle, I realized I was thankful for it. As always, my child’s experiences taught me as much as they did him. They reminded me that when things are hard for us we’re given an opportunity to become better people. 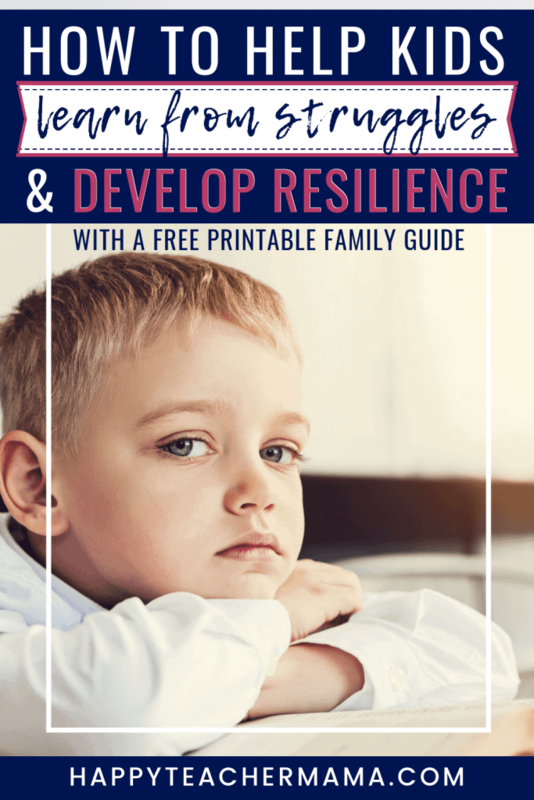 These difficulties also made me keenly aware of the fact that what we teach our kids during these early struggles will carry over into the confidence they’ll have as adults when facing tough situations. So, I decided to create a Free Family Discussion Guide. I wanted to make sure you were equipped with questions and interactive kids pages to help you navigate these conversations with grace and understanding. 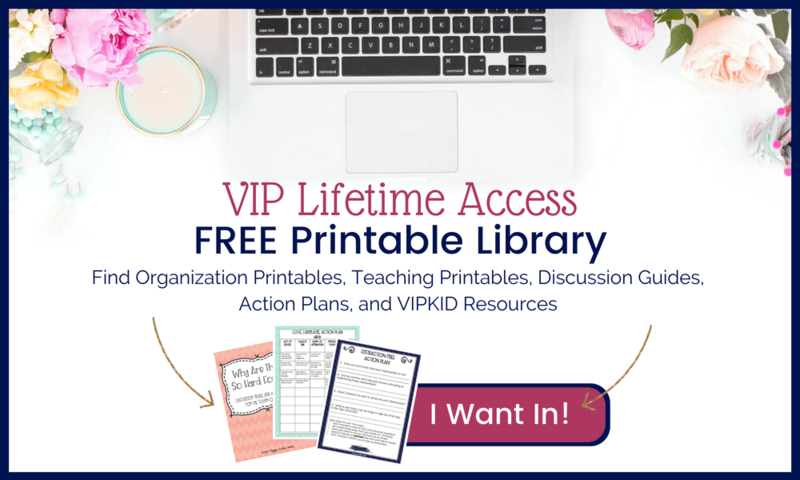 ⇒Grab your FREE Family Discussion Guide Here! If you get nothing else from this post, please remember this…we’re all given a choice. We can let our struggles overwhelm us, or we can experience the necessary learning through struggle to rise above it better than before.